Analytics extends beyond security management and reporting, providing real-time visualization, monitoring and alerting of correlated security data through a single pane of glass. This powerful analytic tool gives stakeholders complete authority, agility and flexibility to perform deep drill-down investigative analysis. Gain insight into network traffic, user access, connectivity, application use, the state of security assets, security events, threat profiles and other firewall-related data. 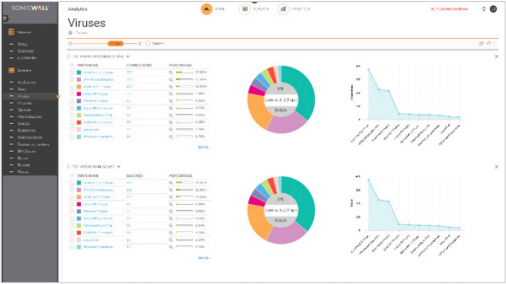 SonicWALL Analytics provides an eagle-eye view into everything that is happening inside the SonicWALL network security environment – all through a single pane of glass. At its core is a powerful, intelligence-driven analytic engine that automates the aggregation, normalization, correlation and contextualization of security data flowing across all SonicWALL firewalls and wireless access points. The application’s interactive dashboard uses various forms of time-use charts and tables to create knowledge representations of the data models. Analytics presents results in a meaningful, actionable and easily consumable manner. This empowers security teams, analysts, auditors, boards and C-suites to discover, interpret, prioritize, make evidencebased decisions, and take appropriate defensive and corrective actions against risks and threats as they unfold in the discovery process. Analytics provides stakeholders with realtime insights and single-pane visibility, authority and flexibility. As a result, they can perform deep drill-down investigative and forensic analysis of network traffic, user access, connectivity, applications and utilization, state of security assets, security events, threat profiles and other firewall-related data. This deep knowledge and understanding of the security environment provides the intelligence and capacity to uncover and orchestrate remediation to security risks, and monitors and tracks the results with greater clarity, certainty and speed. Integrating Analytics into the business process helps operationalize analytics, thus transforming data into information, information into knowledge and knowledge into decisions toward achieving security automation. Analytics transforms data into information, information into knowledge, knowledge into decisions and decisions into actions. 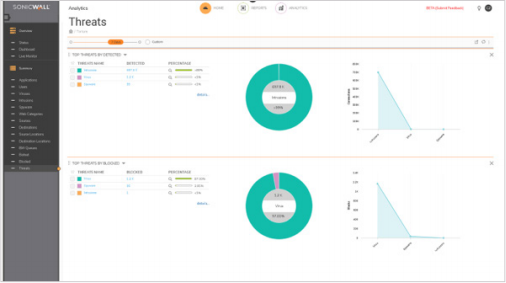 Data aggregation Intelligence-driven analytic engine automates the aggregation, normalization, correlation, and contextualization of security data flowing through all firewalls. 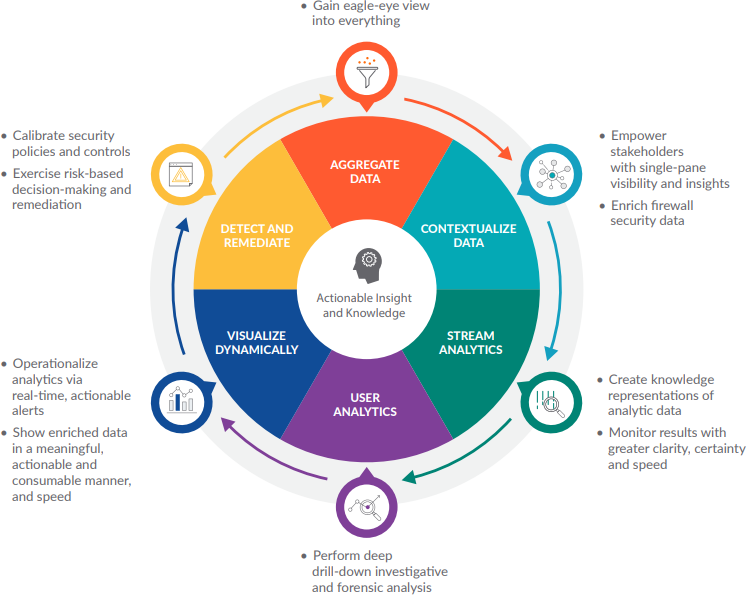 Data contextualization Actionable analytics, presented in a structured, meaningful and easily consumable way, empower security team, analyst and stakeholders to discover, interpret, prioritize, make decisions and take appropriate defensive actions. 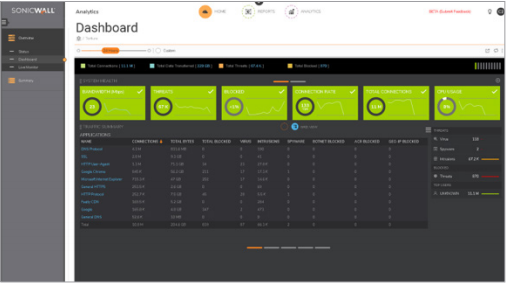 Streaming analytics Streams of network security data are continuously processed, correlated and analyzed in real-time and the results are illustrated in a dynamic, interactive visual dashboard. 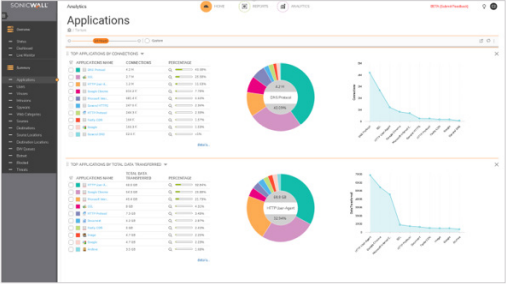 User analytics Deep analysis of users’ activity trends to gain full visibility into their utilization, access, and connections across the entire network. Real-time dynamic visualization Through a single-pane-of glass, security team can perform deep drill-down investigative and forensic analysis of security data with greater precision, clarity and speed. Rapid detection and remediation Investigative capabilities to chase down unsafe activities and to quickly manage and remediate risks. Flow analytics and reports Provides a flow reporting agent for application traffic analytics and usage data through IPFIX or NetFlow protocols for real-time and historical monitoring. 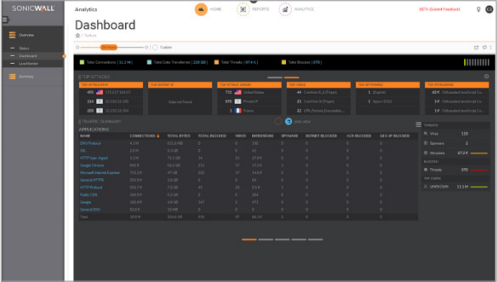 Offers administrators an effective and efficient interface to visually monitor their network in real-time, providing the ability to identify applications and websites with high bandwidth demands, view application usage per user and anticipate attacks and threats encountered by the network. A Session Viewer for deep drill-downs of individual sessions and packets. 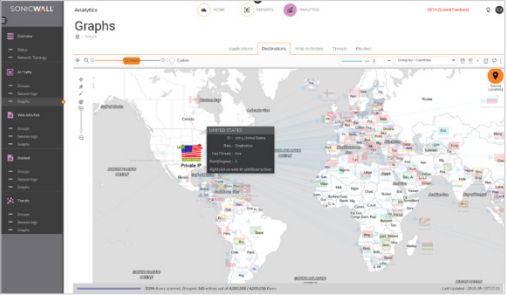 Application traffic analytics Provides organizations with powerful insight into application traffic, bandwidth utilization and security threats, while providing powerful troubleshooting and forensics capabilities.